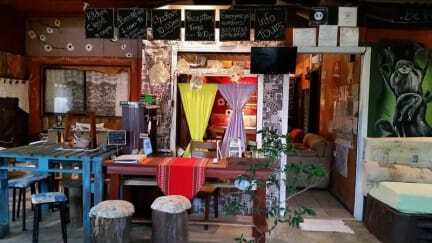 Chillout House is a house of rustic concept and #handmade, part of the remodeling and the areas are done by Edith, the owner of the house, who remodeled it to receive guests who want to share a unique space, vintage and colorfull , Chillout HOuse opened the doors in 2015, the house has 5 private rooms with shared bathroom, and 1 private room with private bathroom. Our house was born with the intention that those who visit us can feel at home, with a quiet environment ideal to rest, but also an environment where you can meet people from all over the world and you can make friends from all sides, the open areas of rest and relaxation are designed to share with everyone in the house, every morning Edith or Daianna her daughter await you with a warm breakfast, pancakes and fresh fruit, or eggs and toast and fresh fruit, you can also enjoy fresh coffee or a delicious hot tea; If you need information about tours or make reservations for activities at home, you can do so at no extra cost. You can use the kitchen if they need to prepare your meals, there are toilets available, TV, Internet, WIFI connection, laundry servie ( for pay) areas and a balcony to enjoy the summer or rainy nights on winter days. Edith and Daianna her daughter, will be waiting for you at the time of your arrival, they are in charge of keeping the house in order and receiving all their guests, Betzy and Monse the younger daughters are also willing to help if they need something, They live right next to the house so they are always very close to help. 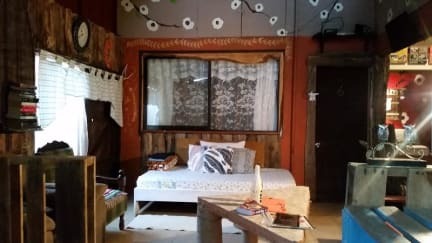 Our house has a rustic concept, with wood decorations, old remodeled items and decorated stalls, so guests who love the details and appreciate the power to recycle and beautify what may no longer be used will be welcome to enjoy this beautiful place made with a lot of love. We are located in the Barrio Valle Bonito, 1km away from the center, a quiet neighborhood full of happy and helpful people, if you like to walk the walk to the center of Santa Elena is liberating, it is 15 minutes of walking with fresh air , we are 5 min by car from all the supermarkets, banks and areas of interest of Santa Elena and Monteverde, so we are relatively close but far from the noise and noise of the busy center of Santa Elena, all Monteverde activities have a pick up directly in the house so you do not have to worry where you can pick up your activities. If you come by bus you can go from the terminal in Santa Elena in 15 minutes. If they come by car, the address is available so they can arrive without problem. If you need a private transport you can contact us to help them. don't Think more :D press Click and Book! Pura Vida!